Honestly, I can’t imagine my afternoon without a little slice of cake. Life just seems more civilized when the afternoon comes with a tea and cake break. However, as we continue to work rain or shine to get the vineyard land prepped for planting, cake breaks are becoming scarce. It’s sacrilegious. I need to remember to pack cake. Nothing delights me more than walking into a coffee shop and seeing sliced cake for sale in the big glass cases. But, while I love my coffee black, I like my tea sweet (honey, cream and a touch of sugar). This is what makes this cake more of a tea cake for me. It’s not overly sweet, it’s more of an adult sweet, as in, not so sweet. Again, perfect with my sweet tea. This particular recipe does not call for butter but utilizes grape seed oil in the recipe, I’m assuming for its clean and light taste. Could you substitute another oil…probably. Let me know how it turns out. Anyway, enjoy this recipe, it’s lovely. Sift together 1 cup plus 3 Tablespoons flour, cornmeal, baking powder and salt in a bowl. Beat brown sugar, oil, Cointreau (or water) and vanilla in a separate bowl with electric mixer until smooth. Beat in eggs. 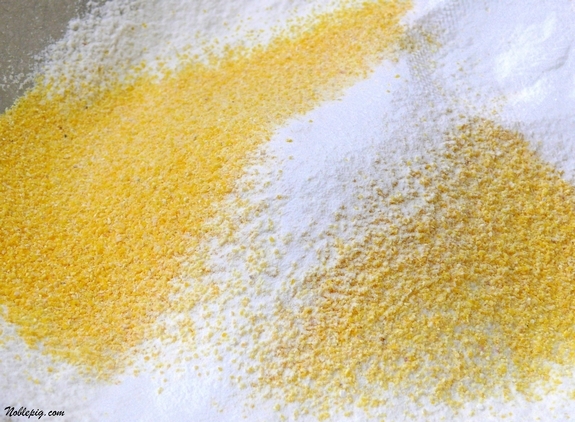 Alternately add flour mixture and yogurt to egg mixture until combined. 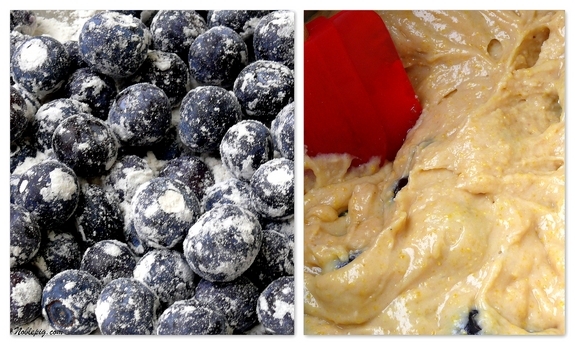 Toss blueberries with remaining 1 Tablespoon flour and fold into batter. Grease and flour a 9 x 5 loaf pan. Pour batter into prepared pan and bake in a 350 degree oven for 70 minutes (mine only took 50 minutes, possibly even less but I hadn’t checked on it; that’s a big discrepancy to me so watch your cake starting at 45 minutes) or until a toothpick inserted in center comes out clean. Cool for 10 minutes before flipping out of pan. To make glaze: Whisk together all ingredients in small bowl. 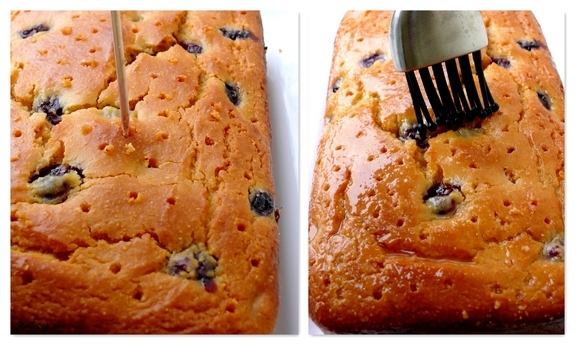 Poke holes all over the top of the cake with a wooden skewer. Brush cake with glaze. Cool completely before serving. This will make your afternoon. Two Years Ago: Are You a Geek, a Nerd or a Dork? I love it when you use cornmeal in your baking. And, cointreau is a great addition. The last time I used cointreau was for a killer pina colada, but I’m happy to bring the bottle down from the liquor cabinet for a gluten-free version of this cake. This looks wonderful, Cathy! hummm… oh god so yummy =) i wish I had one slice of that cake right here ready for me to have a bite. Whata lovely cake. I actually have some grape seed oil in the pantry. Hmmm.maybe I should put it to some good use! I will still most likely cut back on the sugar content a lot but am rejoicing that I have grape seed oil in the pantry (I prefer it to canola oil any day). Dear Cathy – you’ve struck gold again for me ! I am soo making this on my next day off. My bf and I loove blueberries and yoghurt. It will give me an excuse to spend way to much on blueberries as they are starting to go out of season now. I love the ingredients here and the not too sweet. I have grape seed oil so off I go to make this…and the Cointreau of course. This looks like a great cake. I have a ton of frozen black raspberries that will work quite well with this, my blueberries are gone. I woild love to have this with me tea Cathy. 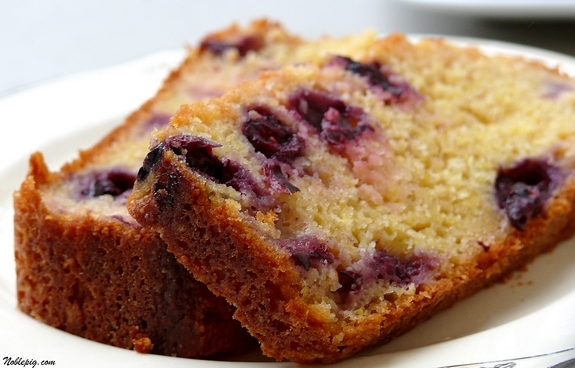 I love your ratio of cake to blueberries….you can never have too many berries for me thank you!!! I love how moist your cake look Cathy. I think you and I have the same habit here. I also can not imagine my afternoon without any slice of cake. Looks like spring and the flavors sound so nice! I could do with more afternoon breaks for intentional tea and cake. Wow this looks good – love blueberries. Something tells me you’re needing that cake break Cathy. Hope the weather’s co-operating! Life is indeed so much better with tea and cake! This looks perfect with a cup of tea. I don’t really care for blueberries, but when paired with lemon, I can’t resist! This looks fantastic! Wow, it looks super moist and so delicious with lemon glaze! This is perfect for an afternoon coffee or tea. This really looks delicious. Love the lemon glaze!! Such a great combo with blueberries! Have a great weekend Cathy! Oh this is a beauty of a lof for a civilized afternoon!! That first photo is a beauty! That looks like a warm slice of that would be perfection with a pat of melting butter on it. MAJOR yum! a day without cake is a sad day indeed! i just love the way blueberries look like little jewels in baked goods. nice recipe, cathy! I’ll take a slice please… It looks fantastic! 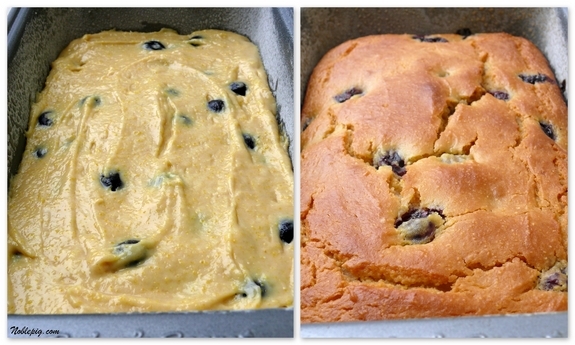 Blueberry, yogurt and lemon? I don’t see any weak links in this one – a wonderful complement to afternoon tea. God, a slice of that blueberry cake and a good cup of coffee and life would be good. Mmm, love the addition of the cornmeal, sounds really good! Hi, Cathy ~~ I have not commented here before, but wanted to let you know that I have become a regular follower of your blog. I’m a native Oregonian, and love your site not only for its recipes but also for your writing about your vineyard and this area in general. This cake looks wonderful. Holy Moly! That looks stunning and delicious. This is something I look forward to making. Plus I already have all the ingredients. Looks really good. YUM!!! I know this is dynamite. Do I need cake in the afternoon? Probably not. Do I need THAT cake in the afternoon? DEFINITELY. 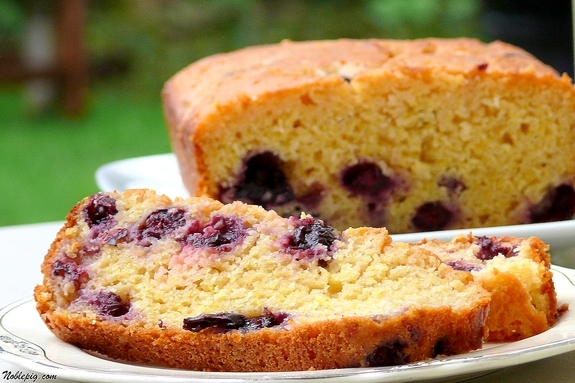 There is a particular pleasure in a well-made blueberry cake. This looks delicious and something I would actually bake. I haven’t visited your site before. You have some lovely things on here! It is lovely to know you are located in Oregon. That is where I am originally from but transplanted to the UK long ago. My sisters are still there so I really miss them and Oregon too. Ooh, this is right up my alley! I am not normally a gooey rich dessert kind of girl (although there have been exceptions!) and this looks wonderful! I can’t wait till my blueberry bushes start producing enough to do something with. I bought some dried blueberries the other day. They are delicious! Cathy! I love this recipe! I just made it this morning and I can’t stop eating it!! YUM! I substituted olive oil for the grape seed oil and it turned out yummy. Thanks for sharing! Here’s a photo of mine.